Showcase IDX's unmatched Premium Plan integrations help you move lead data from your website's IDX to your other web apps better than any other IDX. Learn how we do it, below. Included on all plans... Zapier allows you to instantly connect Showcase IDX with 1,000+ apps to automate your work and find productivity super powers. Premium Integrations give you the power to send not just the lead contact information, but all the lead's search activity on your website, in real-time. Yes, within milliseconds of a lead performing an action on your website, the contact and activity data is sent to your CRM. With your CRM you can use real-time Showcase IDX lead data to capture and distribute contact information without having to manually add it, trigger marketing automations, and keep close track of their activity on your website. 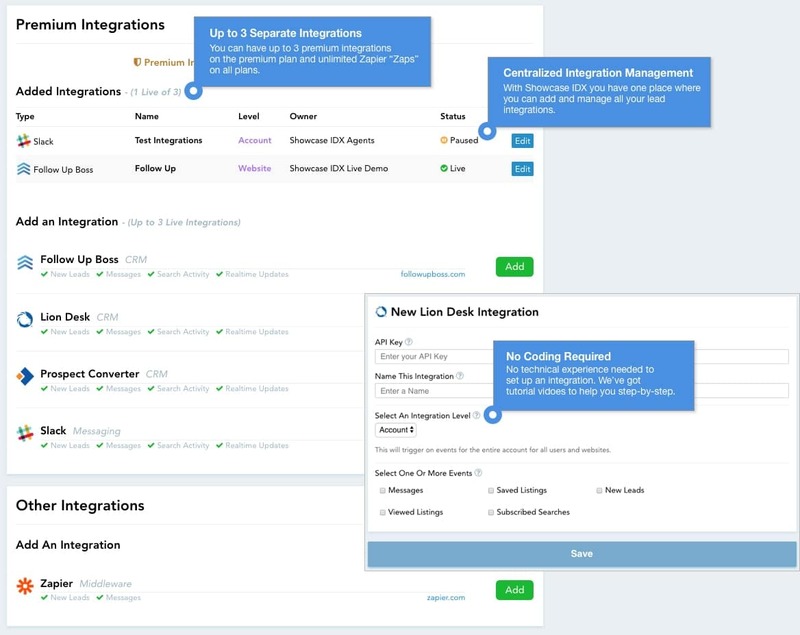 Anyone can set up an integration in minutes. Our integrations manager was made you for you to set up and manage your lead integrations quickly and easily, with surprising flexibility. Our Premium Integrations give you the most flexible, and comprehensive way to move lead data accurately and easily from IDX-to-CRM than any IDX on the market. If moving detailed lead data to other systems is important to you and your business, there is no comparison. We don't just send the lead contact details, we send crucial ongoing activity. We send your lead data through our API integrations to your CRM in milliseconds. You can have up to 3 real-time, premium integrations on the Premium Plan. Select all, or only the types of data you want to send to your CRM. You can easily pause integrations at any time without losing the setup. We give you the ability to send leads from one of your websites to a CRM account. We give you the ability to send all leads for a single agent user to one CRM account. We send over the contact's name, email and phone number (if you ask for it). All message-based leads are sent, tied to a new or existing contact. We send the summary details of every listing the contact views on your website. We send the summary details of every listing the contact saves on your website. We send the summary details of every search the contact saves and subscribes to. We send the summary details of every listing the contact reacts to on your website. We send the summary details of every listing the contact comments on your website.